The music of the Middle East changed my outlook on music fundamentally. The sounds and scales were so different to Western music and the instruments so foreign to me that I felt immediately challenged. And it was wonderful! When I picked up the oud (the Arabic lute), I found playing a fretless instrument tricky at first — not to mention mastering the scales — but after I got the hang of it, I rarely picked up a guitar again. When we first travelled around Turkey many years ago, I heard a guy playing a long, thin instrument at a bus station. It had three courses (rows) of strings on its elegant long neck and a body that was a beautiful, teardrop-shaped wooden bowl, made out of one piece of wood. The guy was playing it through an amplifier and it had a seductive, open-string drone. I was hooked. I asked him the name of instrument. “Saz,” he replied. 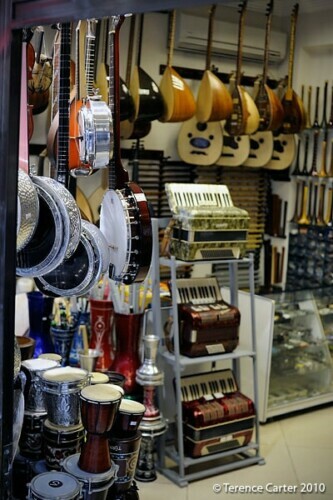 Back in Istanbul, I went to the street where everyone said the best instruments were sold, Galip Dede Caddesi. Walking around the city then (and now), I noticed that every third or fourth person was carrying a musical instrument of some persuasion, and this street appeared to be where everyone went to browse and buy. Istanbul has some of the best live music in the world in my opinion — from jazz to saz (see our guide to the live music scene here) — and in those days, almost every shop on Galip Dede Caddesi was a musical instrument store, from Tünel square to halfway down the steep lane near Galata Tower. I found a shop on the street where the owner was busy finishing a saz, also known as a bağlama, and that’s where I bought my first saz/bağlama. 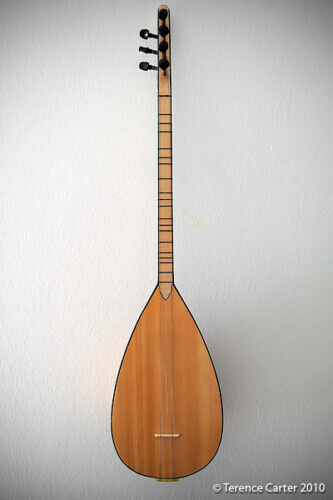 While both ‘saz’ and ‘bağlama’ are commonly-used terms in Turkey, ‘saz’ is actually a Persian word, and the instrument is played in Iran, as well as Turkey and other countries in the Middle East region. You’ll generally see three different sizes of the instrument, although there are about seven different sizes in total. Back then, I chose the most common ‘mid-length’ one, often specifically called — rather confusingly — the bağlama, the same name that defines the whole range of instruments under the one classification. Even more confusingly, there are long and short bağlamas. With its roots in folk music rather than Turkish Classical music, the bağlama is a simple instrument to get a decent tone from if you already guitar player. It’s far easier to learn than the oud for someone used to instruments with frets, as the oud has none and has a very short neck, making the notes much closer together than a guitar. To be a good bağlama player, however, requires a different technique to guitar, the subtleties of which is best left to discovering after you’ve purchased one. Once we returned to Dubai, where we were based at the time, I realized that every time I wanted to just enjoy myself playing an instrument, I picked up the bağlama, and every time I wanted to really challenge myself, I picked up the oud. When we arrived in Istanbul two weeks ago, we were ten months into our yearlong grand tour and I’d been missing making music. Our holiday rental in Cape Town had a piano which I played daily, but that was a rarity. I was determined to pick up an instrument for the last couple of months of the trip. Or go insane. So, the moment we arrived in Istanbul, I returned to Galip Dede Caddesi. Sadly, the street had become more gentrified, with more cafes and souvenir shops, and far fewer music stores (although there are still dozens), and far fewer craftsmen in them actually working on instruments. So here’s the dilemma. If you want a ‘tourist’ bağlama to hang on a wall, the really cheap ones are not that attractive — they’re very plain, and the pretty ones cost a fortune. 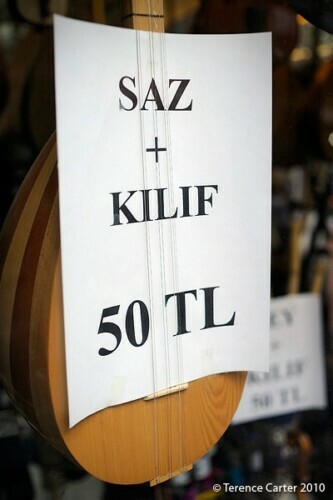 If you’re a musician looking to buy a bağlama, the cheap tourist bağlamas that you’ll find in most of the shops on Galip Dede Caddesi are virtually unplayable. The bağlama I tried was most definitely a very playable instrument, but the fit and finish and anonymous lineage didn’t really inspire me. So I changed my approach to see if I could get a bağlama made my a known maker for around the same price as what I was quoted for the one on Galip Dede Caddesi. 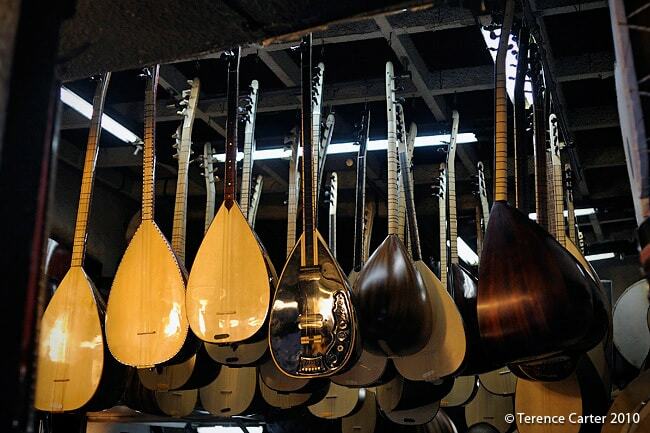 As I had interviewed an oud maker in Turkey before, I knew that some oud-makers or luthiers also made the bağlama. Most luthiers see the bağlama as a more rudimentary instrument than the oud, but I knew that the highly regarded Dr. Cengiz Sarikus was a bağlama player and maker before he became highly regarded as a master luthier. We went to the Doctor’s store and workshop (always a good sign when they’re in the one building) near Fatih and found the maestro and several gentlemen sitting around a table discussing designs for a custom oud, with their sketches laid out in front of them. Most oud players don’t buy off the shelf, which is why if you want to buy a good musical instrument in this region, it’s actually better to order it a couple of months before and pick it up when you arrive. The maestro had a couple of bağlamas in a display cabinet that were finished: a simple one with a lovely bowl made from a beautiful piece of old mulberry wood, and a very ornate one that didn’t suit my needs or budget. He quickly tuned the first bağlama and played a song, singing along to his fluid playing. It was a classic folk song and soon all the other gents at the table joined in singing. Best sales pitch ever. The bowl and top were of excellent quality, but the finish of the bağlama wasn’t. However, the sound and pitch were absolutely perfect. And soon, after a little bargaining, so was the price. After an hour of conversation, about bağlamas, the Doctor’s magnificent collection of instruments, mutual acquaintances made over music forums, and friends and relatives he had back in Australia that he thought we might know, I walked out with an additional piece of luggage, one that would make me (Editor’s note: and the Editor!) very happy during our last two months on the road. Terence playing saz (bağlama) from Gran Tourismo on Vimeo. 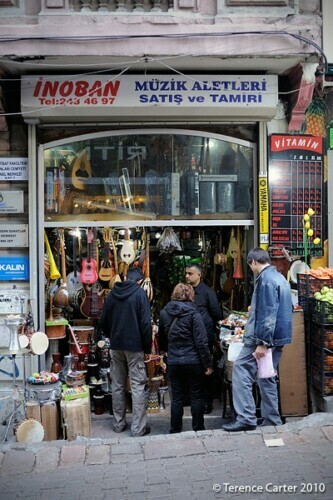 There are other places in Istanbul where you can pick up a bağlama, including Unkapani IMC Blok 6, off Ataturk Bulvari, which has been recommended, but visiting Dr. Cengiz Sarikus at his workshop and store, Veysel Müzik Evi, and seeing his collection of classic instruments (many dating to the 1800s) made the purchase worth it, as was the satisfaction in seeing instruments still made by hand with wood aged on the premises. It’s pretty hard to beat. Sefai Efendi Sok. 21, off Millet Cad. What is the price range for these good baglamas? I’m looking for one and have no idea. I´ve also wondered, why are the metal ones (that look like pots) so much more expensive? Often three times more. Are those also traditional or something newer? Tania, try US$300 upwards. Good luck! I am glad you are interested in this geography’s music. The baglama is a very important instrument in Turkey, and its cousins are found all over other Turkish countries and republics (Uzbekistan, Kazakhstan, Kyrgyzstan…). It is a part of who we are! I’d wish to give you an advice with your permission, the spirit of the baglama and its cousins is very different from that of the oud. In Turkey, the oud is exclusively used in Turkish Art music (or Turkish Classical music as you so accurately wrote), which consists of makam music as you know. 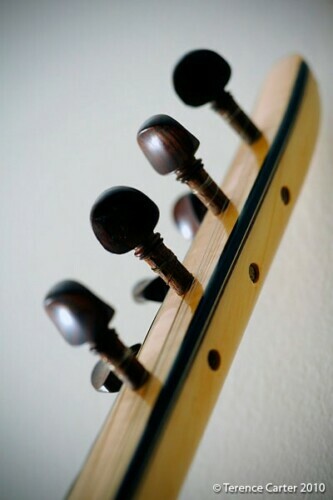 Not only that, but the oud is rooted in the Ottoman music tradition, this is why the oud is a court instrument. In that sense, it is ‘nobler’ than the baglama and its cousins. The Ottoman court’s traditions, mores, “façon d’être” if you will, was sensibly different from those of the Ottoman Turkish populace. The baglama and the instruments that pertain to the same family come from Central Asia, where our language comes from. As you may know, Turks came from Central Asian steppes and settled in Anatolia starting from 650 CE, bringing their nomadic lifestyle and the culture that goes with it. As they mixed with the local population (which we also consider as our ancestors), the ancestor of the baglama gradually changed like them and became what it is today. Since it is a folk instrument, it doesn’t speak about the court’s sad or happy days. It speaks about the simple joy and sorrow of the Turkish peasants, often Anatolians, and does not use makams. It is more of a modal kind of music, that isn’t arabesque in style, content and spirit, but deeply Turkish (directly related to our Central Asian and Anatolian roots). The oud is the spirit of the now defunct Ottoman empire’s nobility, whereas the baglama is the spirit of the Turkish nation which still lives on. We do not play arabesque (although some do, wrongfully so), arabic makams nor do we imitate the oud with it. The baglama is our second mouth. The idea behind posting the audio of me playing the baglama was to demonstrate that I had managed to purchase a very playable baglama for a reasonable price – not to demonstrate my ability to play Turkish folk music. Oh Lovely! I also collect souvenirs from all over the world but never thought of a musical instrument as a souvenir! I think the reason is its size. Uygar – thanks so much. I definitely try to play with feeling to try and touch the listeners’ heart. Cheers! The guy told me to spend 100/200 euro, do you think that anything cheaper sounds bad for an inexperienced person like me? What are the instruments sold just for 50 liras (14 euro!) On your pics? The baglama is indeed easier to get a decent sound out of if you’re looking to begin playing an instrument, it has frets and because of it’s open tuning makes a pleasing sound out of the box. Unfortunately you get what you pay for and the guy you spoke to is correct. ‘tourist’ class instruments are great for hanging on the wall, but a baglama made from an real instrument-maker is not just playable but infinitely better to hang on the wall because of the craftsmanship. The baglama I bought on that trip actually sounds better now than when I bought it. It still stays in tune beautifully too. I think it’s worth the money if you really want to give playing one a go. Good luck! Thanks for your comment on the baglama being the instrument for chilling out and the oud being more challenging. I was passing thro Istanbul recently, and a big reason was to get an oud.. now mind you i have never played an oud, just seen them in Zanzibar. Having played guitar for several decades, and having grown up with eastern melodies around, i was tempted to try playing an oud. But it so happened i was already carrying two other instruments on this trip ( a charango and an Rwandan inanga) and so decided to go in for a baglama on account of it being easier to carry inflight ( with two other instruments).. so i went in a couple shops around the Galata Tower.. at one place ( Irfan’s shop, Uzturk Atatlier), there was a group of folks playing baglamas, and designing one, so i ended spending 3-4 hours in there, with several rounds of tea, and lessons in baglama playing, and i exited with a simple baglama ( short scale – octave + 2 notes), along with a pickup installed inside, for 400 TL. Irfan mentioned its a beginner’s instrument but a good one… well, being totally new to bag lamas i could not make out much difference, except the degree of sustain of the middle course of strings.. seems to me that the better baglamas had way better sustain, but at the same time i didn’t want to pay TL 800 or more then… now, after a month off playing the baglama, almost at a level of addiction, i wish i had ! 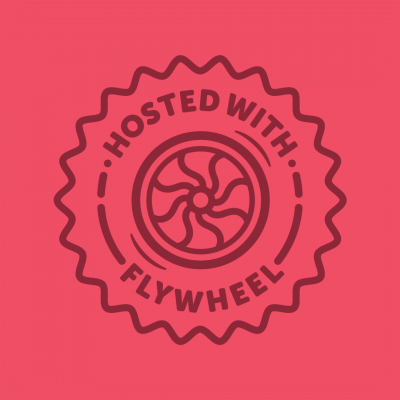 Another reason to return to Istanbul i guess…cheers and thanks for a good writeup ! Thanks. Sounds good, the short scale ones are definitely more travel-friendly than any oud. Plug that baglama into a tube amp like a Fender Twin or Champ, give it some reverb and it’s a pretty wild and beautiful sound. Thanks for your comment and happy playing!